The Virtual Account allows you to shop real products with virtual money! How do I load the virtual account? 2. If you return some products through our "Claims" option, and you want to save time and money (courier taxes) the easiest way to receive them is with a virtual account. 3. Through one of our regular promotions with which we automatically load money on the accounts of our most regular customers. Where do I see the amount in my virtual account? - When your virtual account is loaded, you see the amount in your account (you must be logged in). You have the option to track your virtual account history by clicking the "Virtual Account" sign, there you will find information about all incomings and outgoings of your virtual account. How to shop with the virtual account? - Shopping with your virtual money is extremely easy, before finalizing the order just, enter the desired amount in the "Use virtual account" field. With your virtual money, you can only pay up to 50% of the value of the products in your order! Example: If your cart has $ 50 worth of products, you can pay up to $ 25 of these with your virtual money. With virtual money, you can only buy products marked with a logo: in the bottom right corner of the main photo. Products without a mark on the bottom right corner of the main photo can not be bought with virtual money! The virtual accounts of all new users are locked. To unlock and use your Virtual Account, you need to have an order marked as "Received". The amount of the virtual account can not be paid in real money. The only purpose on the virtual account is to shop from the site. When you return an order or a product from an order, we do not refund the spent virtual money. 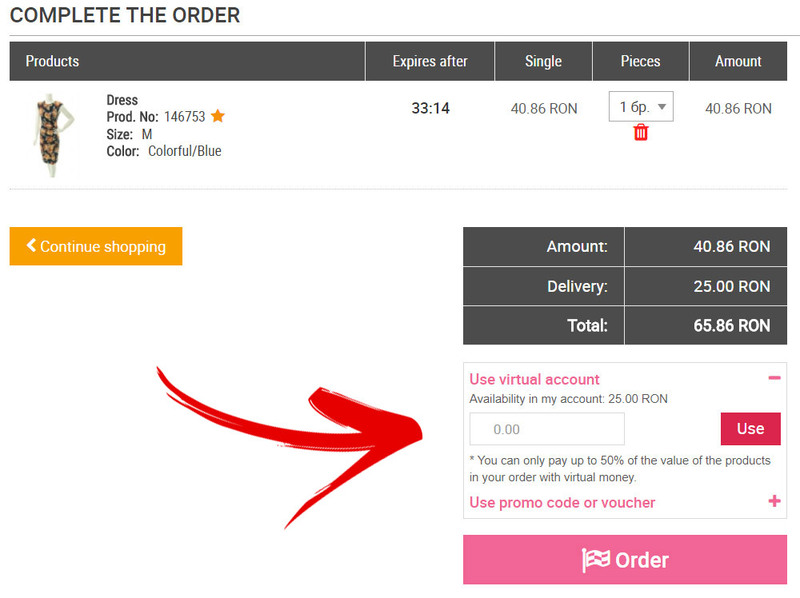 The Virtual Account can not be combined with the Promo Code or Discount Voucher.